Sub: SCERT Andhra Pradesh - School Education – CCE pattern of examination system – Instructions to DCEBs Secretaries for Printing and Supply of Question Papers - Orders – issued – Reg. 1. G.O.Ms.No. 82, School Education (Prog.II) Dept. dated 29-10-2015. 2. G.O,.Ms.No. 80, School Education (Prog.II) Dept. dated 25-10-2017. 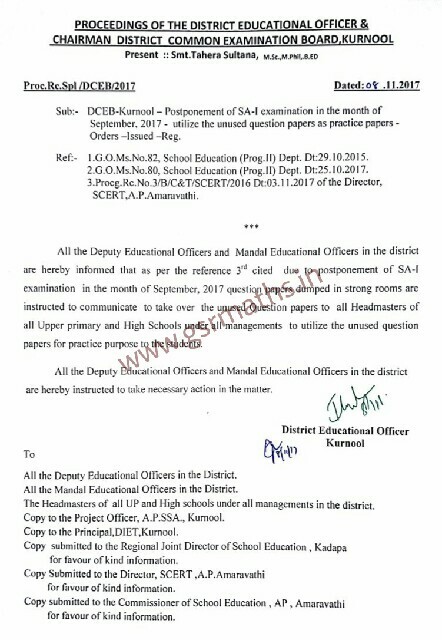 All the District Educational Officers are hereby informed that as per the reference cited above SCERT developed SA-I Question Papers for classes VI, VII and X. In this connection all the District Educational Officers are informed to depute DCEB Secretaries to receive soft copy of confidential material on 6-11-2017 at SCERT. The District Educational Officers of Kurnool and Chittoor are requested to make arrangements to translate the question papers into Urdu and Tamil Medium, instruct DCEB Secretaries to conduct for translation of question papers by involving subject experts. Translation work may be completed on or before 15th, November 2017. Due to postponement of SA-I examination in the month of September, 2017 question papers dumped in strong rooms. Hence all the District Educational Officers are informed to communicate massage to all DCEB secretaries and Head Masters, instruct them to utilize these unused question papers for practice purpose.